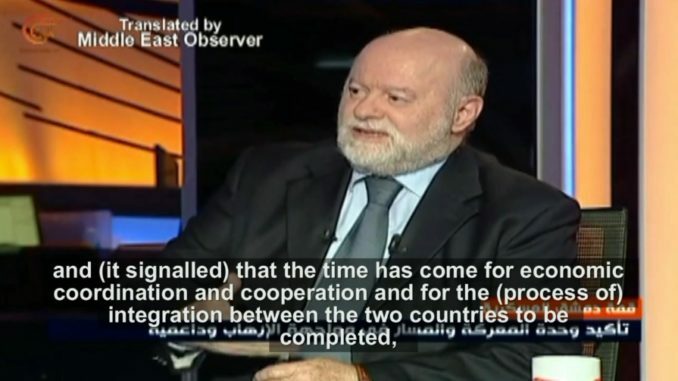 Senior Lebanese political analyst Anees Naqqash commented on the recent military summit in Damascus which brought together the Iranian, Iraqi & Syrian chiefs of staffs, by saying that Israel’s “biggest fear” is the military integration of the “eastern front” alliance which these states form. Naqqash, who is a prominent media figure close to Hezbollah, also explained that this summit reflects the efforts of these three states to solidify the process of long-term strategic integration on all levels. The trilateral military summit brought together the heads of the Syrian, Iraqi and Iranian armies in the Syrian capital Damascus on 18/03/2019. Undoubtedly this trilateral military summit is filled with messages and significance, especially as this is the first time that the three military chiefs of staffs meet on one table – the Syrian, the Iranian & the Iraqi – and in Damascus, which is also important. What messages does this summit hold, and for whom are these messages? There are two points which need to be clarified. Firstly, the image of this meeting is a culmination of President Bashar al-Assad’s visit to Tehran which confirmed two things: 1) for whoever dreams of Syria undoing its alliance with the Resistance Axis – especially Iran and Hezbollah – (they should know that) this is impossible; 2) we are before a new stage which requires strategic political coordination, because we attained victory over terrorism and its sponsors, and there does not remain but a few (occupied) areas and details. The other visit was (President) Rouhani’s visit to Iraq, which also reaffirmed Iran’s role in supporting Iraq in the fight against terror, and (it signalled) that the time has come for economic coordination and cooperation and for the (process of) integration between the two countries to be completed, and this also falls within the context of a long-term strategic axis, because they were not simple agreements (that were signed) – political, economic, security, military cooperation and in all fields. That is why I said (the first) ‘trilateral’ (meeting). A trilateral (summit) today because (these issues) concern this region and does not require a Russian role here, so that it can reiterate what the Iraqi (Chief of Staff) reiterated: ‘the border crossing(s) between Iraq and Syria will be opened soon, so that goods and travellers (could pass) and normalcy between the two countries could resume’. And this is very important strategically speaking when talking about economic integration, (especially) when we know that the two countries, Iran on one side and Syria on the other, are both under an international, Western embargo, especially led by America. So Iraq which is situated in the middle, comes to play a role here, firstly by challenging these sanctions, and dealing with Syria with complete freedom and dealing with Iran with complete freedom, and so I believe this economic integration in the region between these states is the first defeat of any sanctions that is imposed on any one of these (three) states, because any one of them could be singled out. As for the military dimension, there is no doubt about it. Notice how they divided roles between themselves. The Iranian (chief) said that ‘the foreign forces that were not invited by the Syrian government must leave’, and this will indeed occur. The Syrian (chief) was very clear, when he said that ‘all (Syrian) regions will be liberated, either through reconciliation or through liberation (by force)’, there is no leeway in this regard any longer, and ‘there will not remain an inch that is not under the control of the government’, and this will occur soon as well, with the support of the Iranian and Iraqi states, on the borders the terrorist groups must be brought to an end, and there is no difference between east of the Euphrates – in which Iraq has a role to play though – and Idlib which will definitely be dealt with. Thus there is (a process of) integration taking place, I believe the most powerful (message) is not only for Israel, which sees this integration between these states, and the biggest thing that the Zionist enemy fears is the integration of the eastern front against it, but this is also a powerful message for Turkey, which till now is still trying to manoeuvre around (politically), in that it’s seeking to look for solutions with the United States on the one hand, and seeks to find solutions with Russia and Iran on the other hand, this trilateral integration has come to tell (Turkey) that the issue of the danger of terrorism in all of its forms, in all of its forms, we are the ones that will deal with it, and not other powers, and foreign forces must pull out, and the forces that came without the request of the (Syrian) government must leave, and hence you must decide on your stance today, because Iran, Iraq and Syria will not accept action outside of this equation. Hence if President Erdogan is able to think positively, he should join this trilateral (alliance) and say: ‘I accept these rules, that I will not cross borders without the permission of the (Syrian) government and coordination with it, and that we coordinate regional security together’. I welcome this trilateral summit because there must be a balance of forces in the Middle East. I do not accept the continued expulsion and the destruction of the homes of the Palestinian people in the occupied territories and I do not accept the politics of the USA and Saudi Arabia supporting the injustice done to the brave Palestinians by the rough state of Israel. We should not forget that the zionist gangs declared a state for their own in 1948 after having expelled 800.000 Palestinian and destroyed their homes (the Nakbah) in Palestine. This crime has never been punished. To the contrary other major crimes of the Western powers have been committed in the Middle East since. Israel commits crimes on a daily basis. As long as the world looks on the other side when crimes are committed the world will stay a place of hell.